“Zer0 Sum” made the case for a Borderlands-themed adventure game because of the ease with which it adapted the zaniess of Pandora into a mostly gun free adventure game. The episode showed great promise for a series I didn’t think could work, presenting ridiculous and insanely funny situations as a result of Rhys’ fish out of water bumbling and mouthing off. It was during the second episode, “Atlas Mugged,” that I expressed concern that the writers had used up their creative spark because the episode wasn’t nearly as funny. For the most part, madcap humor had been sidelined in order to guide the characters along their main quest. After playing “Catch A Ride,” I’m genuinely worried that Tales from the Borderlands has lost its mojo. Like an amatuer runner who wasted their energy on a hard initial sprint, the humorless zenith of the season threatens to make the game buckle under the weight of its dull plot. Marcus Kincaid, the ever delightful narrator, reacquaints the player with the events that brought Rhys and Fiona into a tense and dangerous standoff between Hyperion president Hugo Vasquez. A last ditched effort allows the pair to escape with the spherical object at that embodies the so-called Gortys Project. They launch a counterattack to rescue their friends Sasha and Vaughn and escape before Vasquez and August have a chance to regroup. Their freedom is short lived due to the appearance of Vasquez’s partner Vallory, the intimidating “Queenpin” of Pandora. When all hope seems lost, our heroes are rescued by Athena, the hooded assassin from “Atlas Mugged” hired by Felix (before his death) to protect Fiona and Sasha. Rhys’ fooling around with the Gortys sphere reveals the truth behind strange machine: it transforms into a small Vault detecting robot. With a cheery disposition, Gortys leads the group to an Atlas bio dome to secure a special upgrade that will lead them to the mysterious Vault of the Traveler. As the highest point in the five episode season, “Catch A Ride” is a chore to site through. The action sequences are dull, the writing is uninspired, and I’ve grown tired of Rhys’ Hugh Grant-esque manner of charmingly befuddled speech. The biggest disappointment, by far, as that the episode really isn’t that funny. There are a few lines that earn a chuckle but nothing as outrageously funny or memorable as “Zer0 Sum.” Instead of pitting the cast against the untamed dangers of Pandora, Rhys and Fiona are given some time to develop their characters. Rhys struggles with the AI ghost of Handsome Jack trying to seduce him to his violent methods of micromanagement while experiencing a budding relationship with Sasha. Fiona, under the tutelage of Athena, is set upon the path of a Vault Hunter. I liked the idea of Fiona’s transformation, but the guidance she receives is heavy handed and more reverent than I expected. On the other hand, Athena’s wisdom unlocks a new decision based gameplay mechanic that allows Fiona to tackle a given situation one of two ways. Another fault with “Catch A Ride” is its shoddy direction and scene transitions. Everything about the episode, from the switch in camera angles to character animations, is stiff and uncomfortable. Characters move with the grace of a wooden plank, their bodies twisting and turning as if placed atop a Lazy Susan. During action set pieces, the scene direction has a tendency to cut away too soon or too late, lessening the impact of the situation. There were numerous technical issues with these transitions, like the brief glimpse of character models stuck in previous poses and actions. After failing a quick time event at the beginning of the episode, the game put me back to the beginning of the sequence while Rhys was stuck in a struggling animation where he was supposed to be ducked behind a crate. None of the other episodes had the same level of technical faults and the shoddy production only adds to fuel to my fire of sadness. Three episodes in and I’m already experiencing Tales from the Borderlands fatigue. It doesn’t help that I’ve been hooked with Life Is Strange, another episodic adventure that does well because it breaks away from the gameplay conventions Telltale has been using from the very beginning. The all too familiar Quick Time Event mechanic, featured prominently in “Catch A Ride,” is old and its age is made all the more noticeable because of the weak story. It’s also unfunny, hurt by technical issues, and fails to inject excitement in its own narrative, one that I still have no idea of where it’s planning to go. Telltale needs to recapture the magic and greatness of the first episode if it wants to bring Tales from the Borderlands to a satisfying conclusion. Tales from the Borderlands isn’t a perfect story-based representation of the shooter franchise, though it is home to some really great characters and a few good laughs. “Escape Plan Bravo” makes up for the series' weakest moments by taking players deep into the rabbit hole that is Hyperion's corporate culture. “Atlas Mugged” is a disappointing stumble to what started out as an amazing burst out of the gate and I'm left hoping the next episode can make the rebound. Tales from the Borderlands is an amazing addition to the Telltale library. Telltale puts its own spin on things but fans will appreciate their faithfulness to the source material. 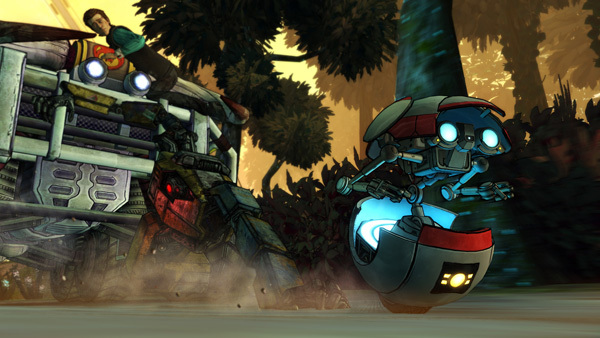 Over, under and through, Borderlands: The Pre-Sequel! is a Borderlands game. If you enjoyed previous games, you'll enjoy this one, though I'm happy to see that Gearbox proper is taking a break from the series for a bit. I also hope that this will not be the last we see of 2K Australia, who managed, despite using a license, to let their own voices shine through. With the majority of changes being positive, the only thing that should give someone pause over taking the plunge is whether or not you want more Borderlands.